Completes the look of your gondola end caps! No more open back and display more merchandises! This pegboard back panel kit is designed to fill the open gap between a end cap and double-sided gondola units. Constructed with heavy gauge steel, these panels can be easily added to the back of gondola end cap displays to create the finished look. Please note: Gondola unit sold separately. 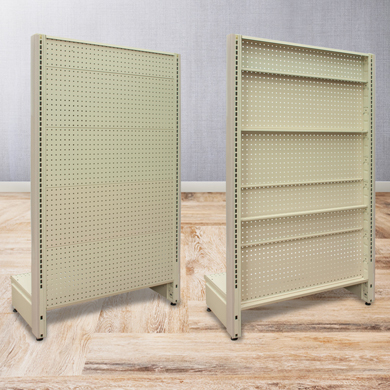 Just add pegboard accessories to the back panels to double the merchandising capacity! Gondola end caps are available to purchase separately, click here to view our Sahara Beige Gondola End Caps in different heights.